After a career as a successful corporate lawyer, civic reformer, and federal judge in Ohio, John Hessin Clarke was appointed by woodrow wilson to the Supreme Court in 1916. He served only a short time on the Court, however, stepping down in 1922 to work for U.S. entry into the League of Nations—becoming one of the few justices to leave office while in reasonably good health. During his brief tenure Clarke earned the respect of his fellow justices and became known for his liberal positions on many issues. A Progressive Era Democrat, he joined with Justice louis d. brandeis on many votes. He also wrote the Court's opinion in Abrams v. United States, 250 U.S. 616, 40 S. Ct. 17, 63 L. Ed. 1173 (1919), in which the Court upheld the conviction of several radicals accused of fomenting unrest and in the process helped define the Court's position on free speech issues for decades to come. Clarke was born in Lisbon, Ohio, on September 18, 1857. His father, John Clarke, Sr., was an Irish Protestant who immigrated to Lisbon in 1830 and became a successful lawyer and judge. Clarke attended Western Reserve College in Hudson, Ohio, graduating Phi Beta Kappa in 1877 and receiving a master of arts degree in 1880. After college Clarke returned to Lisbon to study law under his father's tutelage. He passed the bar with honors in 1878 and practiced briefly in his father's firm. At age twenty-three he moved to the nearby city of Youngstown and opened his own corporate law firm. He soon gained a reputation as an excellent lawyer and developed an impressive list of clients. Clarke also became an active citizen of Youngstown. He bought an interest in the local Democratic newspaper, the Vindicator, and used it to promote progressive political reform including national civil service reform and free public libraries. He was an active participant and speaker in a local literary society. Clarke did not marry. In 1897, after spending seventeen years in Youngstown, Clarke moved to Cleveland, where he joined the firm of Williamson and Cushing. His clients there included the Erie Railroad, the Nickel Plate Railroad, and the Pullman Company, maker of railcars. In Cleveland, Clarke continued to advocate progressive political reform, sometimes conflicting with the interests of his clients. He became part of the circle of Tom L. Johnson, Cleveland's Democratic mayor (from 1901 to 1909) and a leader in political reform. Among other things, Clarke pushed for limits on railroad fares and profits. He also sought to impose antitrust laws on the rail industry. In 1896 Clarke opposed the populist policies of fellow Democrat William Jennings Bryan, who ran for president that year. Unlike Bryan, Clarke supported the gold standard, a policy that fixed the value of the dollar in terms of a specific amount of gold. Clarke's name came up at times for political office, including that of governor and of congressional representative but he declined such invitations. In 1903, however, he finally ran for the U.S. Senate as a Democratic candidate. His platform advocated radical reform, including municipal ownership of street railways, equalization of taxes, direct election of senators, institution of Workers' Compensation, and disclosure of campaign finances. Clarke lost to the more conservative incumbent, Mark Hanna, a fellow native of Lisbon. He sought the Democratic nomination for the U.S. Senate again in 1914 but withdrew when a popular politician, Thomas Hogan, entered the race. Clarke later supported progressive reforms including women's voting rights. 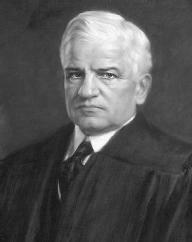 At age fifty-six the silver-haired Clarke began a judicial career when President Wilson appointed him to become a federal judge in the Northern District of Ohio. Only two years later, on July 14, 1916, Wilson summoned him again, this time to be a nominee for the U.S. Supreme Court. Wilson hoped that Clarke would join with Justice Brandeis—who had been confirmed shortly before Clarke's nomination—in moderating the conservative slant of the Court. Taking the place of charles e. hughes who had stepped down to run for president, Clarke met Wilson's expectations. He took a liberal stance on most issues, becoming, for example, a strong advocate of enforcing antitrust laws against business monopolies. He also made many decisions that were pro-labor. "It is not uncommon for ignorant and corrupt men to falsely charge others with doing what they imagine that they themselves, in their narrow minds and experience, would have done under the circumstances." Clarke had become wary of the potential of large corporations to eliminate competition and infringe on the rights of workers. One of his most important contributions to the history of the Court was in the area of antitrust law. He dissented in several decisions early in his term—including United States v. United States Steel Corp., 251 U.S. 417, 40 S. Ct. 293, 64 L. Ed. 343 (1920)—in which the Court found the defendants not guilty of violating antitrust laws. However, in United States v. Reading R.R., 253 U.S. 26, 40 S. Ct. 425, 64 L. Ed. 760 (1920), the Court majority joined him in his earlier dissenting position, dissolving a railroad holding company because it was, according to Clarke's opinion, "a menace to … interstate commerce within the meaning of the Anti-Trust Act." Then, in United States v. Lehigh Valley R.R., 254 U.S. 255, 41 S. Ct. 104, 65 L. Ed. 253 (1920), Clarke garnered unanimous support for his opinion, in which the Court opined that a railroad had bought up its competition in order to gain a Monopoly on rail service. Lehigh Valley R.R. served as a model for antitrust decisions during the 1930s. Clarke often sided with labor and he opposed efforts to use antitrust laws against unions. He upheld labor's right to strike in several cases and in Bunting v. Oregon, 243 U.S. 426, 37 S. Ct. 435, 61 L. Ed. 830 (1917), he voted to sustain Oregon's Minimum Wage law and its ten-hour workday limit. Clarke's record on civil liberties was less uniformly liberal. Although he often voted with fellow justices Brandeis and oliver wendell holmes jr., he differed with them in Abrams. At issue was the First Amendment's Free Speech Clause, which states, "Congress shall make no law … abridging the freedom of speech." The case involved Russian-born anarchists and socialists who had been accused of distributing leaflets calling for weapons workers to go on strike during World War I. In the Court's opinion, Clarke wrote, "the defendants plainly urged and advocated a resort to a general strike of workers in ammunition factories for the purpose of curtailing the production of ordnance and munitions necessary and essential to the prosecution of the war." Clarke said that the Sedition Act of 1918, 40 Stat. 553, allowed for the restriction of speech that intended to disrupt the conduct of the war, even if that intention had not led to such disruption. This interpretation of the First Amendment remained dominant for several decades. In his dissent, Holmes argued that Clarke and the majority had overblown the effect of "the surreptitious publishing of a silly leaflet by an unknown man." Clarke again opted for a conservative interpretation of the First Amendment in U.S. ex rel. Milwaukee Social Democratic Publishing Co. v. Burleson, 255 U.S. 407, 41 S. Ct. 352, 65 L. Ed. 704 (1921). In that decision, Clarke upheld a Milwaukee postmaster's denial of mailing privileges to a socialist newspaper, claiming that a mailing permit was a privilege and not a right. Clarke resigned from the Court in 1922 on his sixty-fifth birthday. He left in order to become an advocate for U.S. membership in the League of Nations. Among the reasons for his resignation, he told Brandeis, was his perception that many of the cases accepted by the Court were trivial in nature. Clarke was suffering from health problems, including loss of hearing and a heart condition, and he had been greatly affected by the death of two sisters. He also resented the hostility of the conservative justice james c. mcreynolds. President Wilson wrote to Clarke of the resignation, "I am only sorry, deeply sorry. Like thousands of other liberals throughout the country, I have been counting on the influence of you and Justice Brandeis to restrain the Court in some measure from the extreme reactionary course which it seems inclined to follow." During his time on the Court, Clarke wrote 129 opinions and 23 dissents. In the same year that he resigned Clarke became president of the League of Nations Non-Partisan Association of the United States, a position he held until 1928. After the carnage of World War I Clarke put great stock in the League of Nations' efforts "to devise some rational substitute for irrational war as a means of settling international disputes." Clarke worked hard as an advocate for the League of Nations, traveling around the country, making speeches and campaigning for the cause—and spending a good deal of his own personal fortune in the process. He also became an active trustee of the World Peace Foundation in 1923. Plagued with respiratory problems in addition to his heart condition, Clarke retired to San Diego in 1930. He remained disappointed by the United States' persistent isolationism and its refusal to join the League of Nations. In the 1930s Clarke made known his support for franklin d. roosevelt's New Deal legislation. In 1937 he made a radio address speaking in favor of Roosevelt's plan to add more justices to the Supreme Court. He was greatly saddened by the events of World War II and told a friend that he "began to gravely doubt the existence of a moral government on this seemingly abandoned planet." He died in 1945, shortly before the explosion of the atomic bomb on Hiroshima and the formal creation of the United Nations.